The Provincial Grand Lodge Of Cornwall, celebrated 300years on Sunday. A special lunch @ The Great Western Bristol Hotel in Newquay was held to celebrate this, along with a raffle and auction of items to raise money for the many charities supported by the Lodge. 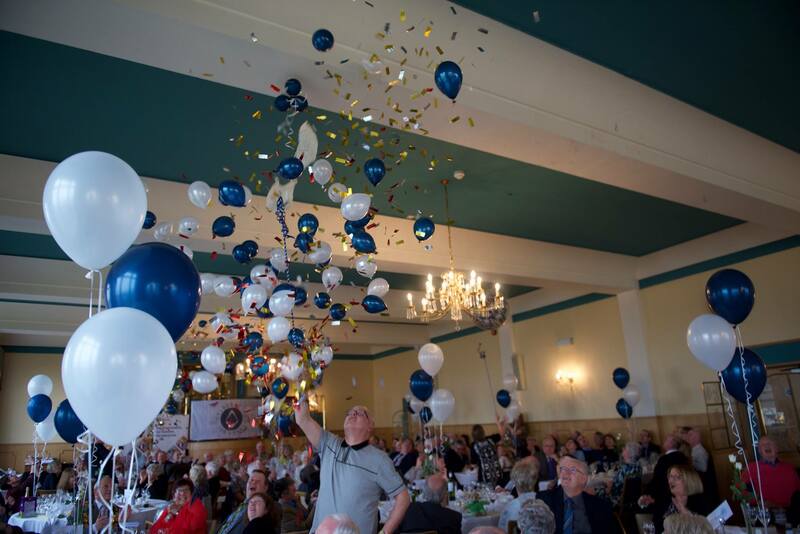 Balloon decorations transformed the dining room, using their colours of midnight blue and white. Guests entered the dining room through a string of pearls arch with long curly ribbon decoration. In the centre of the arch was a star foil balloon showing their emblem. 3 balloon table decorations on each of the tables, a string of pearls balloon arch over the beautiful cake, made by The Little Cornish Cake Company. 3 exploding balloons, hung from the ceilings each filled with small balloons and metallic confetti. Each balloon represented 100 years and once popped - small air-filled balloons and metallic confetti would descend over the floor in celebration of such a great landmark.